The Rocol WD Spray is part of the Rocol's Frontline range, these are the most widely used products and cover a full circle of lubricants used in various industries. Multi-purpose maintenance spray Penetrates, lubricates, displaces water and protects against corrosion. An aerosol dispensing a blend of solvent refined mineral oil that also contains corrosion and oxidation inhibitors, extreme pressure additives and a friction modifier. 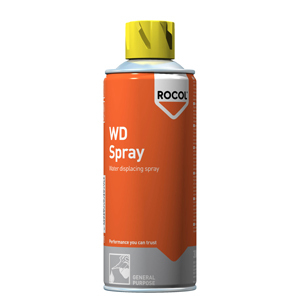 ROCOL WD Spray is a multi-purpose product that displaces water, penetrates to release corroded parts, provides light lubrication and leaves a corrosion resistant film. Particularly suitable for the protection and the drying out of engine ignition systems, coils, distributors, H.T.leads, spark plugs etc. Multi purpose spray rapidly displaces moisture leaving a protective film.